Since joining HMF nine months ago, Genevieve has brought great energy and organization to our team as Registration Manager. If you have a question about registration, Genevieve is the one you talk to. 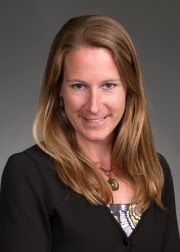 She has also been instrumental in rolling out our new Deferment Credit Policy, whereby runners can choose to defer race entry up to 14 days before the event and use credit toward a future HMF race. Learn more about Genevieve below to put a face and a story with the helpful guru of all things race registration related! Coordinate every aspect of online registration for each of the HMF events. Answer customer questions related to registration, maintain and manage the registration databases, update marketing database with information for all HMF runners. Assist HMF team by providing weekly reports related to registration trends. Order bibs for all HMF events. Coordinate bib mailings and Mail My Packet mailings to our runners. Set-up and manage Packet Pick-up for certain events. Coordinate large group registrations for Hartford Marathon. The Registration Team works on Race Day and any Packet Pick-up times. We lead a team of volunteers to handle the bib assignments for pre-registered runners, handle race day registrations and bib assignments. Answer any questions related to registration. Coordinate with timers to ensure smooth results presentation. I have been a runner since childhood, when my elementary school gym teacher started a running club for students to arrive early at school and run a ¼ mile loop around our football fields. I participated on my high school swim team, and running was great cross-training during that time. Throughout high school and college I ran for pleasure, but ran my first “competitive race” as an adult when I participated in a 5K sponsored by Silk City Striders in Manchester, CT. I enjoyed the spirit and camaraderie at the race and began entering more 5K races. I don’t run to compete, rather I simply enjoy being out with a pack of runners enjoying the course and having fun. Now that I am a mom, I need running to keep my stress-level down but I’ve suffered a few running related injuries the past three years that have made it harder to enjoy. My favorite time to run is when I roll out of bed at 5AM and hit the pavement by myself – it’s the best way to start my day! I loved being a part of the 20th running of the Hartford Marathon. I was still relatively new to HMF and was really impressed watching our staff, and so many volunteers, put on a spectacular event for thousands of runners and spectators. By race day, the whole team was physically and mentally exhausted, but standing back and watching the racers and the crowds was awe inspiring and kept us going. I’m excited to take what I learned and improve on it for October 2014! The 2009 Blue Back Mitten Run was my favorite race to run. I had just recovered from a month-long sickness after and was feeling really great. The course was awesome and I ran the best 5K time of my life! I really love to see older generations participate in races. I always applaud hardest for the 60 and above age group awards. I hope to be out there enjoying running for the rest of my life – so these folks inspire me! I don’t like to sit still for long. I want to add….I really love being part of an organization that works REALLY hard, but has fun while doing so, and provides healthy events that give back so much to the community. We all know that things come up unexpectedly. Maybe you get injured while training for next month’s goal race. Maybe your sister announces she is getting married on the same day you are registered to run the Hartford Marathon! No matter the reason, we don’t want our runners to suffer with a lost race entry. We have developed our new deferment credit policy, effective February 15, 2014, to give our runners greater flexibility. You may now choose to defer race registration up until 14 days before the event for ANY reason, and the deferral credit will be valid to use on any other HMF event for one year from the date of the event you originally registered for. Please note: Students receive discounted entry fees, therefore their deferrals amounts listed above will be reduced by $5. Please visit our website for more details on our new policy, or email registration@hartfordmarathon.com or call us at (860) 652-8866 x 2 with specific questions. We look forward to racing with you this season! Today, February 5th, is National Girls and Women in Sports Day. As a woman, a mother, a runner and a professional, I have many reflections on the purpose of this day. I wanted to share the thoughts of a respected colleague, Dr. Beth Taylor, who touts great accomplishments of women in sports but also asks poignant questions on what's holding women back. I can’t think of anything more exciting than writing the following: February 5 is National Girls and Women in Sports Day! As a woman, and a mother, and a runner, I celebrate all the strong and fit women who participate in sports, especially given how far we’ve come. For example, at the first Winter Olympics in 1924, there were only 11 women competing in 2 events. By contrast, there will be 14 events for women in Sochi. Similarly, we’ve made progress from the first summer Olympics in Paris, where 22 women competed in lawn tennis and golf. In the 2012 London Olympics, women made up 44% of participants, and it was the first Olympics in which women competed in all events. However, there are still major obstacles facing women in sport. 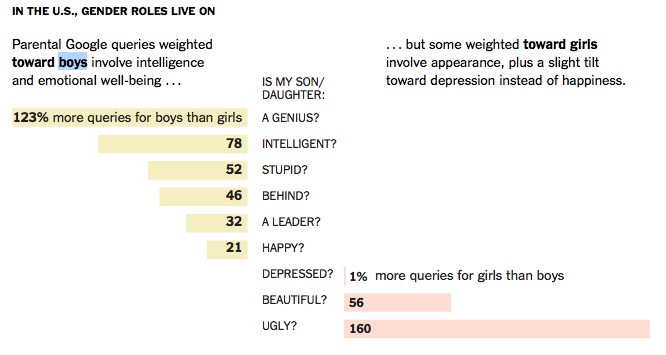 For example, in a recent New York Times column, economist Seth Stephens-Davidowitz noted that according to Google searches, “parents are two and a half times more likely to ask “Is my son gifted?” than “Is my daughter gifted?”” By contrast, “parents Google “Is my daughter overweight?” roughly twice as frequently as they Google “Is my son overweight?”” Overall, Google queries for children are disproportionally skewed towards intelligence concerns for sons and appearance concerns for daughters, as the chart on the right indicates. This is troubling. Moreover, inequalities in activity patterns begin early, with 8-12 year old girls already spending almost 20% less time being physically active than their male peers. This trend continues across the adolescent years, as boys demonstrate increases in aerobic fitness, while girls exhibit decreases in fitness. The bar graph on the right graphically illustrates these trends, with NHANES data representing the percent of male (dark green) and female (light grey) children and adolescents achieving the recommended physical activity guidelines of 60 minutes/day. These early gender differences may explain in part why adult men typically spend more time engaged in vigorous exercise than adult women. Why is this important? We all know the physical benefits of exercise, but according to this report by the World Health Organization, girls who participate in sports are more likely to achieve academic success than those who do not play sports. Female high school athletes express a greater interest in graduating from both high school and college, and are more likely to become sexually active later in life. Furthermore, girls who play sports are more empowered and view their bodies as a source of strength rather than a sexual or reproductive resource for men. HUZZAH! So how do we get girls to be more physically active? Interestingly, factors associated with regular vigorous activity in girls are highly social and psychological. They include having friends who exercise, being involved in a sports team, believing in the importance of exercise, and having self-confidence about exercise. Consequently, it seems to me that, as women, the more of us who exercise, the better it is. By engaging in physical activity, we create a community of strong role models and social support for other women and girls. This fosters confidence that women belong in sport, whether it be for recreation or competition. In the spirit of the Olympics, I’ll finish with a great example of how the support of just one woman can sustain belief across a lifetime.